Following the fall in the markets last week, some of the froth in the valuations of Indian equities has come off. The accompanying Chart 1 shows the one-year forward price-earnings (P-E) multiple of the MSCI India Index has come down from its recent highs to where it was at the beginning of January. That’s not much of a correction. In contrast, valuations for the MSCI World Index, a gauge of developed markets, are now well below what they were at the beginning of December. Note also that the premium for the Indian equities over other markets in the region has remained intact, indicating that the fall in the Indian markets is purely on account of global factors. Domestic brokerage house Kotak Institutional Equities feels valuations are still not quite in the “buy" territory and going ahead, the quality of corporate earnings growth will be key. “We find the valuations of the Indian market to be still rich. Even assuming no risks to the quantum of earnings growth over FY2019-20E, the quality of earnings growth is quite poor, with a large portion of incremental profits of the Nifty-50 Index and KIE Universe Coverage coming from sectors such as PSU banks, metals & mining, oil & gas and utilities, which should logically trade at lower multiples," Kotak said in a note dated 6 February. Sharing a similar view, another broking house Motilal Oswal Securities Ltd said the story is shifting from P-E expansion led by low cost of capital to earnings recovery now, unlike in the past three years, when low cost of capital aided multiple expansion. One pocket of the Indian stock market that rose too fast too high was the mid-caps. As Chart 2 shows, valuations there have moderated as well, more than for the front rankers, but they are still elevated. “Mid-caps are trading at a premium of 40% versus large-caps, an all-time high. 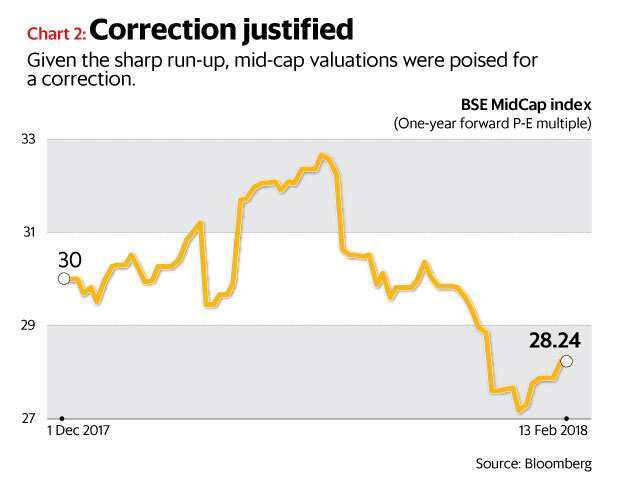 The recent correction has moderated this premium—albeit still remains high—and offers a little more breathing space," added the Motilal Oswal report. Whether valuations come down for Indian equities will depend on what happens in the developed markets. The last time global markets tottered, during the China scare in late 2015 and early 2016, valuations in the Indian market were much lower than at present.